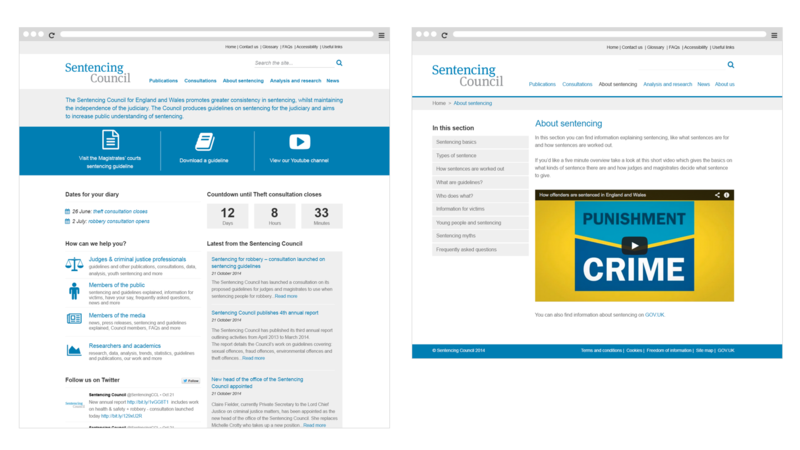 Knowing the power and importance of digital technology, the Sentencing Council wanted more than just a website. They were looking for ways to transform their offering, taking a number of non-digital tasks and making these digital, to streamline what they do, whilst working towards becoming a paperless office. 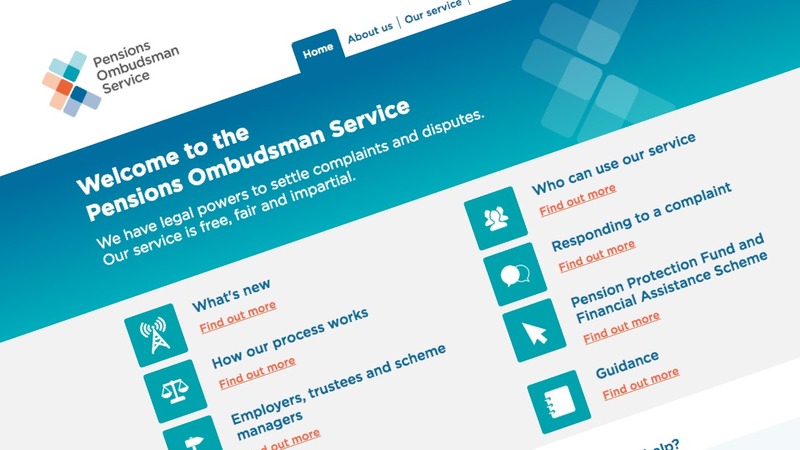 The first piece of the digital requirement was to move the existing website, and strip back any of the unnecessary information, getting to what users truly wanted from the Sentencing council website. Part of this task was moving the Magistrates Sentencing Guidelines, a printed piece that was large and cumbersome (and made up of a number of differing design styles). Making it web friendly and easy for users to search and view, whilst also allowing the Council to easily amend and make updates on a regular basis. Added to this, was the ability for Council members to have a secure place, where they could collaborate and share information. 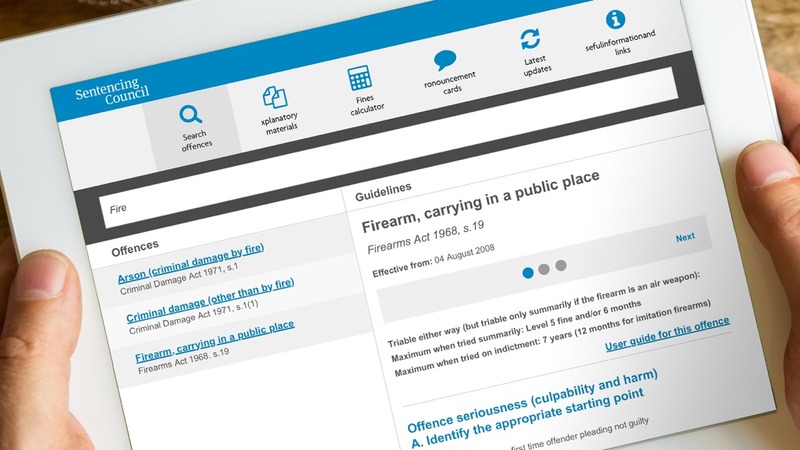 Working with magistrates (the key users), we gained key insight into the issues that they face when dealing with the diversity of offenders, crimes and sentencing guidelines. Also getting an understanding of what other stakeholders were interested in from the Council, such as how they arrived at the guidelines. Taking these learnings, Bang re-developed the information architecture and design to make it easy for users to access and use the information. In the process the site was moved onto a WordPress platform, allowing the Council freedom to make changes with ease. A responsive design was also applied to give the best experience for users accessing from different devices. The library of Sentencing Guidance was firstly standardised, working with the magistrates to develop a design that best worked for them. Each guideline was then categorised on a number of levels to ensure that users could find the guidelines quickly and simply. Templates were configured and set-up in WordPress to enable the Council to easily add, edit and update current and future guidelines. Feedback from Magistrates at the prototype stage also led to a number of tools being added to the Guideline area. This included an interactive fines calculator. A secure login area for members was designed in conjunction with the Council, allowing them to collaborate on documents, register their attendance for meetings, and download necessary meeting papers. 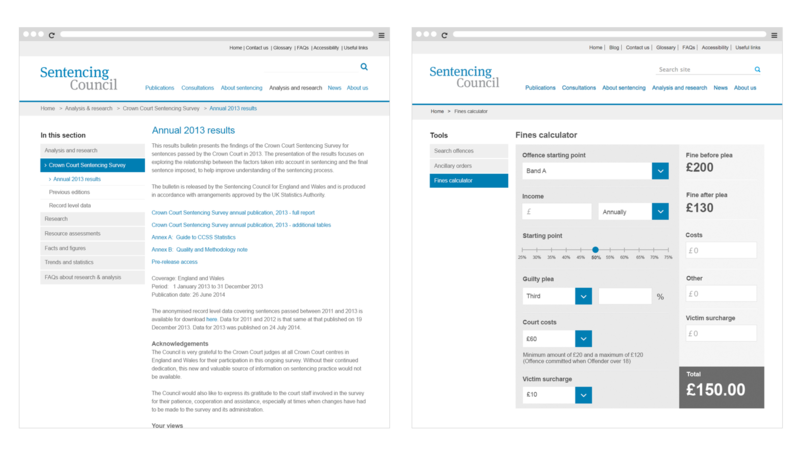 Following the successful launch of the website, members’ section and guidelines area, the Sentencing Council looked to Bang to develop a tablet based app for Magistrates to use in and around courts.